A 52.4 ultra marathon, which is basically the marathon course run in reverse starting at midnight (for charity) and then the regular marathon. The Main races drew a field of 17,975 finishers: 6447 for the full marathon, 7389 for the first half (the GG Bridge must be a draw), and 4139 for the second half. The weather was perfect – mid 50s, no wind to speak of, and a bit foggy. Again, perfect! This was my first San Francisco Marathon event, but my third crossing of the Golden Gate Bridge this year (previous crossings were the Emerald Across the Bay and the Presidio 10.) This race boasts allowing runners to run on the roadway; which was a nice change from the other two, since they are on the bridge’s sidewalk which repeatedly diverts around the bridge’s supports. The start waves for the First half were well managed, being combined with the Full Marathon’s waves. Volunteers were everywhere, which was fantastic. It is obvious that this is “done well” and has incorporated lessons over the years. 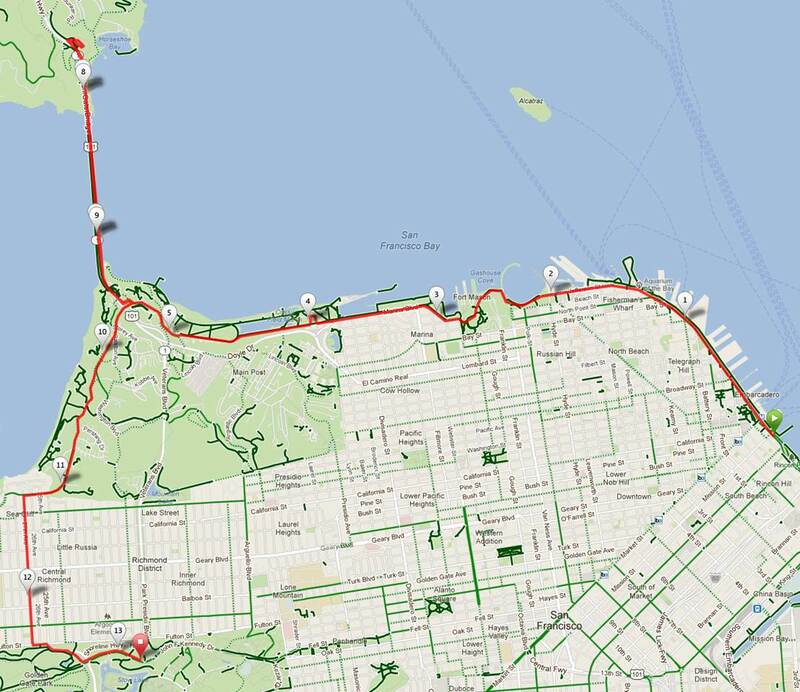 The First Half’s course itself heads from the Embarcadero along the Bay, up to the Bridge deck, then across and back, along the coastal portion a bit, then into the Richmond part of San Francisco, and finishes in Golden Gate Park. It starts flat, teases you with a short hill, resumes a flat portion just to lull you into speeding up, before slamming you with the climb up to the bridge. The Bridge itself is an incline/decline in both directions – again, to play with your tempo and pace. Off the bridge, it’s a nice decline, followed by a pair of steady inclines, on toward the finish line in Golden Gate Park. The First Half is NOT a cake walk – though, with proper training and a good pace plan, it is not insurmountable. It was a great challenge for me and I sure appreciated my hill prep during training. At the First Half finish line, there was food and drink for runners – really a great atmosphere to recover from the run. I breezed through, after picking up my checked bag, and headed to the complimentary buses that took runners back to the starting line. I had heard the lines can get long…I ended up not waiting at all. Back at the start area, I walked around and watched people finish the Second Half and the full marathon for a bit, then headed back to the hotel. …aaaand they git out of my way! At the start line…ready to go! Garmin time: 1:52:37 at an 8:30(? )/mile pace. Official time: 1:52:37 at an 8:36/mile pace. Let me start by saying that I am pleased with my results. Finishing with a sub-2 hour time, in the top 11% overall , 17% in men, 15% of my age group, and 13% of the mens masters is great. That said, I didn’t run against 7,385 other people – I ran against myself and the goal I set, which was 1:49:41. Honestly, I know I could have made or beat that goal, but there were several things that impacted it – most of which I could not control…one of which would have probably made meeting it possible. As you can see in my plan/results comparison chart, “traffic” was terrible and I actually was passing people almost the entire race – for sure from mile 4 onward…to include the hills. The thing is, at times, my pace slowed to a 10:30+ pace due to traffic (people running the pace for their wave (which is OK), or people walking/running 4 across (which isn’t OK.) At three points, my pace slowed to over 11:00! I spent most of the race running on the far right or left edge of the lane, passing people – at times, moving into oncoming runner traffic (sorry!) In my previous two races across the Bridge, I easily maintained an low-8 minute pace, so I know I could have done my 8:15 plan. The other thing that I missed was having people to pace/draft. Since I was in a wave with pace times ranging from 11:27 to 12:59, I was moving ahead of most people (my pace plan was an average of 8:22.) In most cases, passing people would be cool, but not always. Pacing or drafting is great when I’m feeling tired – I missed that. The weather was perfect – mid 50s, no wind to speak of, and a bit foggy. Karen and I stayed at the race hotel, so I was close to the start line. I woke up at 0330, downed a bagel, hit the shower, and got ready to leave. I had set out my kit the night before, so I was able to take my time getting ready. As I was about to leave, I kissed Karen goodbye and she wanted to take a picture. As I was leaving, she said, “hey, where’s the thing that goes on your shoe?” I had completely forgotten to put my “D” tag on my shoe – removing it from the bib at the Race Expo (to take a photo with my bib) and tossing it in with the other SWAG/ads in my expo bag! DISASTER AVOIDED – THANK YOU, BABE! Once at the start area, I was able to trade my race shirt (in addition to my 11/2011, estimated finished finish time changing, I lost a shirt size of weight! ), check my finish line bag (UPS did an awesome job! ), and use the toilet one last time without any lines. I got to the wave 7 start area and lined up in the front (per my strategy.) The race started on time and so did each wave. I hit start on my Garmin at 6:22:49 and booked. My rant about traffic aside, I ran the entire race full out. I ran each hill/incline with an even effort. As for pre-race fuel and prep, I carb loaded three days prior – knowing that Saturday might be a challenge staying up in the City (and it was.) Loading plan was to eat a high percentage of carbs each day (I ended up with Thurs: 83%, Fri: 86%, and Sat: 72%) by exceeding my daily caloric intake by ~550 calories. 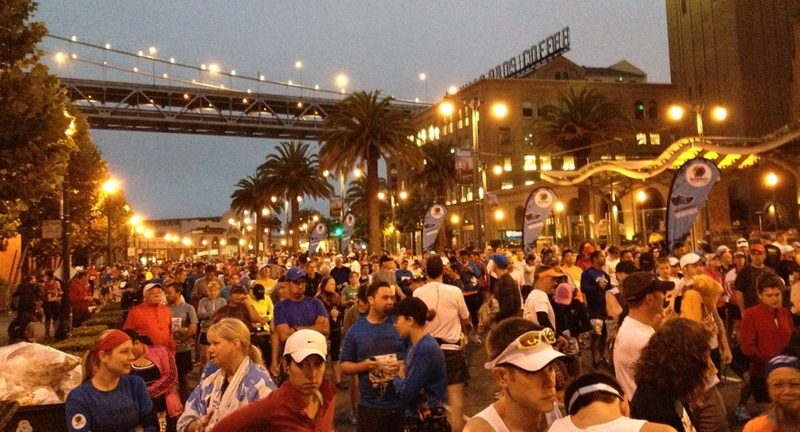 On race morning, I ate a bagel at 0330 and a couple of GU gels at :45 & :15 before the start. During the race, I took a GU every 3 miles and drank about 20 oz of GU Brew. I didn’t partake of any of the race’s aid offerings, opting to run through each station. Again, I am pleased with my results. The training plan that I’ve been following paid off and I learned more about myself, my abilities, and race strategy and planning. Sportin’ ma space blankie & smilin’! 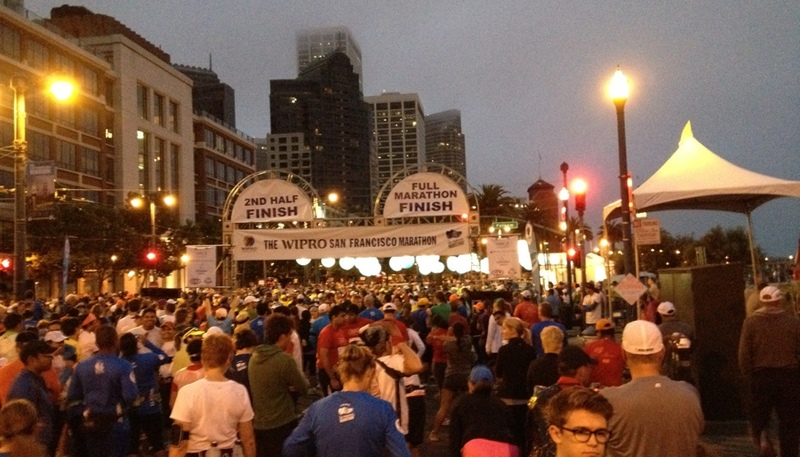 The SF Marathon was a great experience. Great enough that I’ve already registered for the 2013 edition, running the Second Half so I can snag a “Half it All Challenge” medal. My plan is to do the full marathon in 2014 and join the 52 Club! Comments: I did 15.3 miles at an avg of 13.3 mph. Continuing to give my left foot/heel some rest. I will probably bike again tomorrow and do a VERY easy run on Friday.